A solid blaster for $20, but the slam-fire may need adjustment. Zuru tends to occupy the less expensive spectrum of foam flinging, from small pistols like the Reflex 6 and Xcess to larger platforms like the Regenerator and Turbo Advance. However, there’s an area around the $20 mark that’s mainly occupied by box sets of smaller blasters, and not a midsize blaster. The Turbo Fire fits that niche, offering both twenty shots and slam-fire capabilities. However, it has some issues with the “slam-fire” mode, which make it slightly less useful (but that’s easily fixed). Overall, though, it’s still a nice blaster that may be worth a look. The Turbo Fire was, earlier this decade, one of Zuru’s main blasters, featuring pump action and twenty shots. It originally came in green, and featured several iterations before coming off of shelves. 2019 now features the redesign. The Turbo Fire is a rear-priming blaster, with twenty shots in the drum. The new blaster also features a foregrip molded into the shell, and a pop-up sight sits on top. Storage for eight darts sits in the middle of the drum – it’s purely storage, not another firing row like on the Turbo Advance. The grip is decently large, with an enclosed thumbhole but no real stock to speak of. It has textured molding and is easy to grip and use. On the whole, the blaster feels sufficiently sturdy in hand. Not quite the same feel as a Nerf-branded blaster, but good enough to not feel cheap. Admittedly, I’m torn on the design. It seems like a long blaster for holding out in front of you (no real stock, after all) and slam-firing. It could’ve lost the front “barrel” and still have been a fine looking, but shorter blaster, more like a pistol. However, that’s a matter of personal taste. The Turbo Fire features an interesting setup on the inside. The large plunger tube is expected at this point, as it would be with the Turbo Advance. In this case, however, there are a series of spring-loaded tabs within the blaster, in addition to the standard catch system. Ridges in the plastic body depress the tabs at set points, allowing for them to reset. In the case of the tab on the plunger, it allows the user to slam-fire the blaster when depressing the trigger. It means having a larger plunger, but it works. There is a similar tab attached to the rotation arm. Normally, after moving back with the plunger and rotating the drum, the tab would hit a ridge, depress, and then reset in the forward position. However, in my experience, slam-firing the blaster would often result in the blaster getting stuck at this transition point, like the tab wasn’t fully depressing in order to let the plunger’s priming motion continue. I ended up shaving off perhaps 1mm in height (if that), and that solved my issues. I do not know if this was merely a fluke in my blaster, but it’s now documented, just in case someone else has the same problem. The Turbo Fire, when firing properly, hit 82fps on average with the included darts, and 76fps with Elite darts. With slam-fire working as intended, I was able to hit almost four darts per second in rate of fire. Good performance, as you’d expect from modern Xshot blasters. Zuru has a nice pattern or redesigning their older blasters so far, with updates on the Reflex 6, Xcess, and now the Turbo Fire. 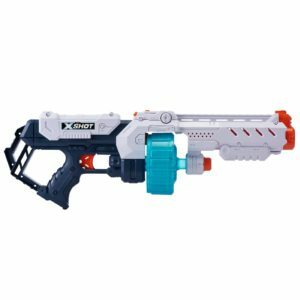 $20 gets a mid-sized blaster with great performance and ammo capacity, but it does have a potential issue with slam-fire that may need to be addressed in order for the blaster to fully function as intended. 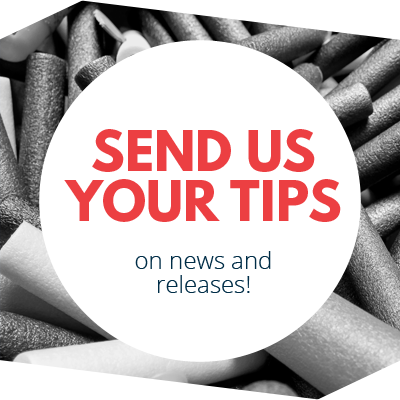 Once it does, however, it’s a great option for an inexpensive stock blaster. 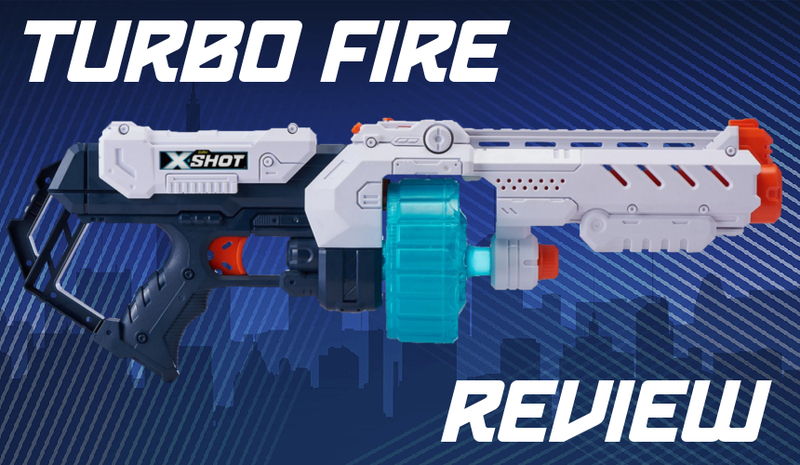 This entry was posted in Dart Blasters, Reviews and tagged 2019, blaster, blaster hub, review, turbo fire, xshot, zuru on January 17, 2019 by BuffdaddyNerf. 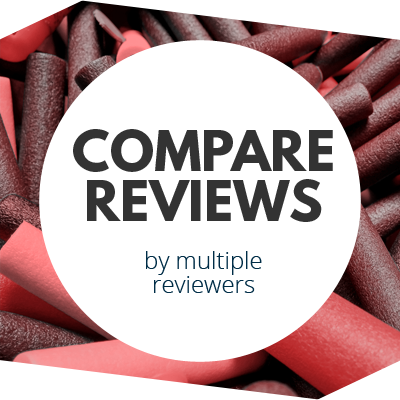 Nerf Accustrike Accutrooper Review Drone Slayers, Nerf Leaks, and More! Similar malfunction produced TurboFire which I purchased. After reading, and repairing an article, I came to work very smoothly. Thank you.